The Workout app in Apple Watch Series 2 includes two new swimming options to show off its waterproofing. This is a key differentiator over the cheaper Series 1 model, and yet very few reviewers actually took their test units for a swim. One even claimed that all the pools and beaches in New York were closed, so they couldn’t test this feature. So I decided to take the plunge with Series 2 and find out for myself if it sinks or swims. Over the past two weeks, I’ve tested my Apple Watch in a variety of swimming conditions, including various public pools — and even the Mediterranean sea. My daily running route takes me past the beach. On a sunny day, I like to dive in for a quick dip, then dry off in the sun while I jog back home. The original Apple Watch was not waterproof, so I had to take it off before my swim and leave it on the beach, hidden in my sweaty running shoes and buried under smelly socks, to deter thieves. Waterproofing means I can now wear my Apple Watch Series 2 throughout my workout, so I don’t need to worry about it getting stolen. This past month I’ve soaked my watch with fresh water, chlorinated pool water and salty seawater. It still works just fine, and I no longer need to worry about watch thieves. For me, this alone is enough to justify the upgrade. Good luck finishing a workout if your Apple Watch is still wet. While the hardware itself is now waterproof, the user interface is not. You must manually enable the waterproof mode (although this does happen automatically when you start a swimming workout), and that much-touted water-ejection feature doesn’t always get rid of all the water in the speaker cavity on the first try. Sometimes I have found that you need to turn on and off the waterproof mode again after a swim to force it to eject all the water. But the biggest drawback of the waterproof mode is that the touch screen is disabled. Touchscreens use the different dielectric properties of the air and your skin to detect when you touch the screen. The trouble is that water is also a dielectric, and this can confuse the sensor. I’ve found this is particularly problematic with seawater. In order to finish your workout, you need to swipe left and then tap the End button. However, this does not work if there is still seawater on the screen, and it is impossible to wipe this off when you’ve just gotten out of the water and are still soaking wet. Touchscreens are rare in sport watches for precisely this reason. Most rely on physical buttons, which you can operate even when the devices are submerged. As a flexible, multifunction device supporting a wide variety of applications beyond exercise, Apple Watch must make some design trade-offs. Which means that, when it comes to specific applications — such as swimming — Apple Watch just can’t compete with dedicated hardware devices. Let’s be honest, if you have to turn off the user interface when it is in water, that is hardly a fully waterproof solution, and it’s not ideally suited for swimming. Is the convenience of having one watch that can do everything a sufficient justification for making these compromises? If you are serious fitness fanatic, probably not. After all, it is easy to switch watches when you are going to work out. I already have to switch watch straps (stainless steel for formal, fluoroelastomer for exercise). Changing watches instead of straps would actually be less hassle. Wearables have gotten pretty good at logging runs, but they are far less reliable when it comes to swimming. The trouble is that when you swim indoors, with your wrist submerged underwater, it is impossible to get a good GPS signal. And while the motion in your wrist is sufficient to estimate your steps as you run, with swimming, the water makes it impossible for a wrist-based device to detect leg motion. As a result, swimming watches tend to be quite inaccurate. Some don’t even attempt to log open-water swimming. Instead, they rely on you telling them the length of the pool you are swimming in. Then they simply attempt to count the number of lengths you complete, and multiply this to get your distance. By providing options for both pool swimming and open-water swimming, Apple is being pretty ambitious. So how accurate is Apple Watch when it comes to swimming? If you like casual lane swimming at your local pool, then Apple Watch Series 2 is not a bad companion. You can set it off at the start of your workout, then completely forget about it until the end. It is impressively accurate at counting your lengths, which I find quite helpful because my mind often wanders and I lose count. I tried it in both 25-meter and 50-meter pools. As long as you set the pool length correctly at the start, your distance at the end is precise. Apple Watch Series 2 can even count lengths when you do a flip turn instead of pushing off from the wall. And the tedious stop-starting that is often necessary when the pool is busy didn’t seem to faze the new watch either. Apple Watch also seems accurate at recognizing strokes. All of which is quite impressive. But there are some disappointing limitations. If you do more than one kind of stroke, it just says “Mixed.” So if you like to swim alternating lengths of breaststroke and front crawl, for example, you are out of luck. Apple has recently introduced auto-pause for running workouts, but this is not yet available for swimmers. So if you like to rest between lengths, you will need to remember to pause your watch manually — which is tricky when you are also trying to hold onto the side of the pool. Oddly, the iPhone Activity app shows your swimming workout split-times per 100 yards (or meters), rather than pool lengths. Disappointingly, it provides no breakdown of number of strokes per length, a stat that proves useful for estimating your efficiency. Another gripe I have is with Apple’s handling of distance units. With running workouts, if you select kilometers on the watch, then that is how your workout is displayed on your iPhone as well. With swimming, however, this seems broken: Your distance units are not preserved — it uses the region settings of the iPhone instead. Outside of the regular confines of a pool, accurately tracking your swimming becomes a more challenging task. On the plus side, since you are outdoors, Apple Watch Series 2 can in theory use GPS to track open-water swims. In practice, this is only possible if your wrist spends sufficient time above water. So if you are doing front crawl, you might get a signal, but with breaststroke you are probably out of luck. To test its accuracy, I took my Apple Watch Series 2 for a swim at Platja del Bogatell in Barcelona, Spain. I swam the length of a pier that I had measured on Apple Maps to be 500 meters long. A there-and-back swim should have been 1 kilometer, but according to my Apple Watch, I only swam 78 meters. That’s a big difference. Stroke recognition also broke down on open-swimming workouts. In my tests, it only ever reported a “mixed” stroke. Since this had been very reliable in the pool, my guess is the motion of the waves in the sea somehow throws off Apple Watch’s sensors. Overall, I was pretty disappointed with the open-water swimming feature. But to be fair, lots of competitors don’t even attempt this, and those that do tend to be equally unreliable. Has Apple swum out of its depth? 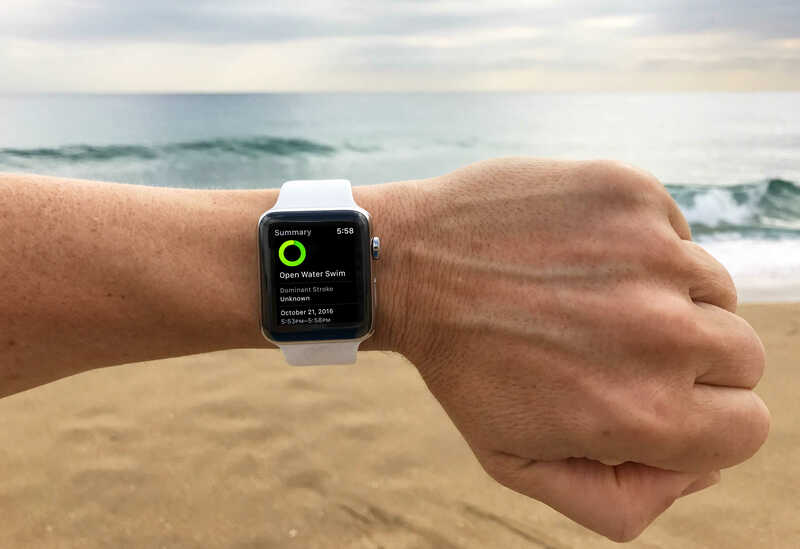 Problems with the touchscreen user interface, the lack of reporting on basics such as strokes per length, and the inaccuracy of open-swim tracking means that Apple Watch Series 2 is unlikely to be popular with serious swimmers. 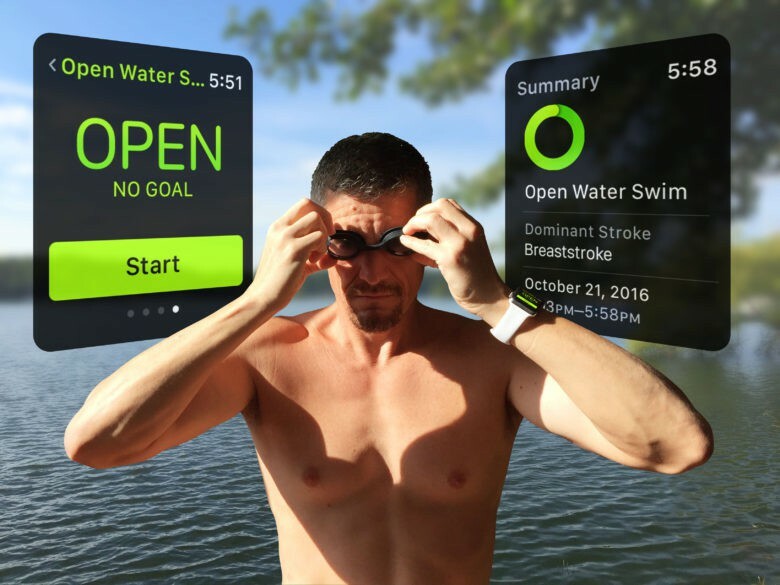 Perhaps some third-party apps will resolve the shortcomings of the built-in Workout app for swimmers, as they have done for runners. But for the time being, swimming with Apple Watch Series 2 is more of a novelty than a serious feature. Editor’s note: This post has been updated to clarify the reason the Apple Watch touchscreen gets disabled while in waterproof mode.